c o mplic a t e d h e r o Some r equir ements: Title may be one or mor e lines long. Title o v erlaps the imag e but t e aser aligns t o it . T e xt k eeps the lay out if ther e is no imag e.
Imag e is c ont ent , not b ack gr ound. c o mplic a t e d h e r o Ho w t o do it ? width declar ation (using ) c alc().
" c o n t a i n e r "
t i t l e "
m a i n "
a s i d e "
f o o t e r "
" g a lle r y "
I n v a l i d ! s e n s i t i v e .
https://vienna2017. drup al. or g /sessions/whats -ne w-css -intr oduction- css -grid-and-css -cust om-pr operties T ak e the sur v e y! https://www .sur v e ymonk e y . c om/r / drup alc onvienna Thank y ou! m a d e on 2 4 . View What's new in CSS? Introduction to CSS Grid and CSS Custom Properties on Notist. "Great talk, really liked the examples and code. Good technically in depth." 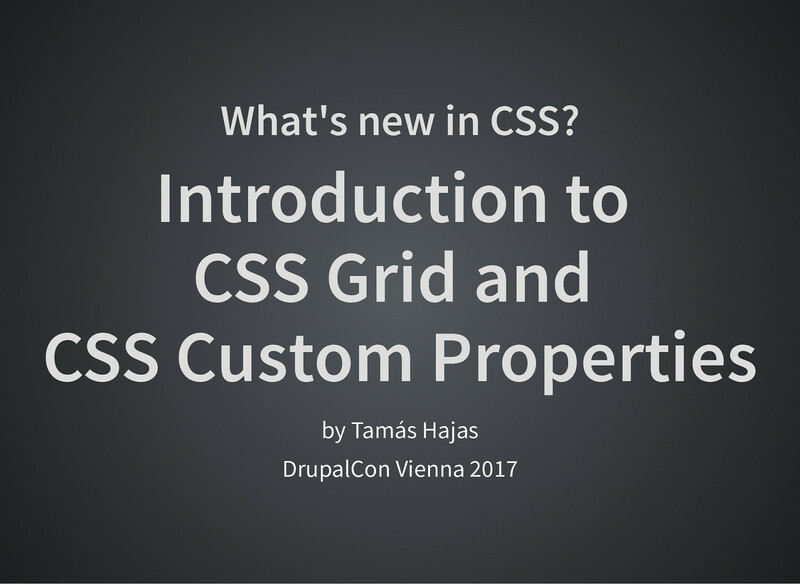 "An excellent and very relevant talk, I was very excited to be introduced to CSS grids and this session didn't fail (my fav of DrupalCon). The presentation was direct, thorough, and given clearly." "Fantastic teacher. Loved this session." thamas puts presentations on for free. You can too.